You Are Here: Home → Anthony Rendon Is the Nationals’ Mr. Anonymous. He Shouldn’t Be. Except that it does. And the result is that Rendon was arguably the best overall player on the Nationals this season, as he was in 2014. Consider this season’s credentials: He posted a .301 average with 25 home runs and 100 runs batted in. Advanced statistics and scouts rank him among the elite third basemen defensively. While he stole only seven bases, he is an astute and swift base runner. “That’s the best part of Rendon’s game that is really under the radar,” Nationals General Manager Mike Rizzo said. This season, Rendon was one of only seven qualified hitters with a batting average of at least .300, an on-base percentage of at least .400 and a slugging percentage of at least .500, putting him in the same category as two former winners of a Most Valuable Player Award — Joey Votto and Mike Trout — and a potential future winner, Jose Altuve. 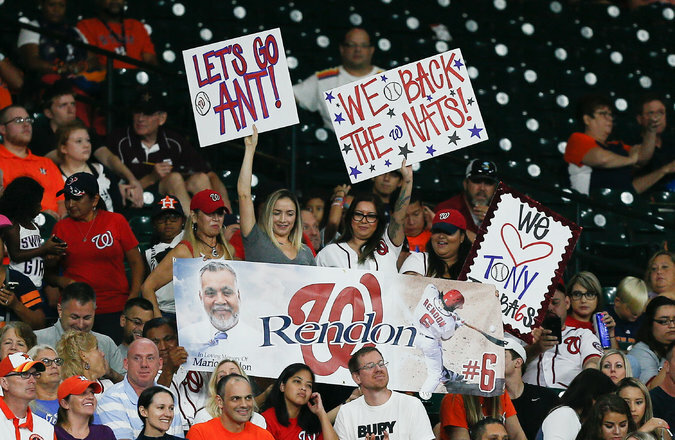 Rendon, who is from Houston, had his own rooting section there when the Nationals visited the Astros in August. His peers, of course, are aware of all this.